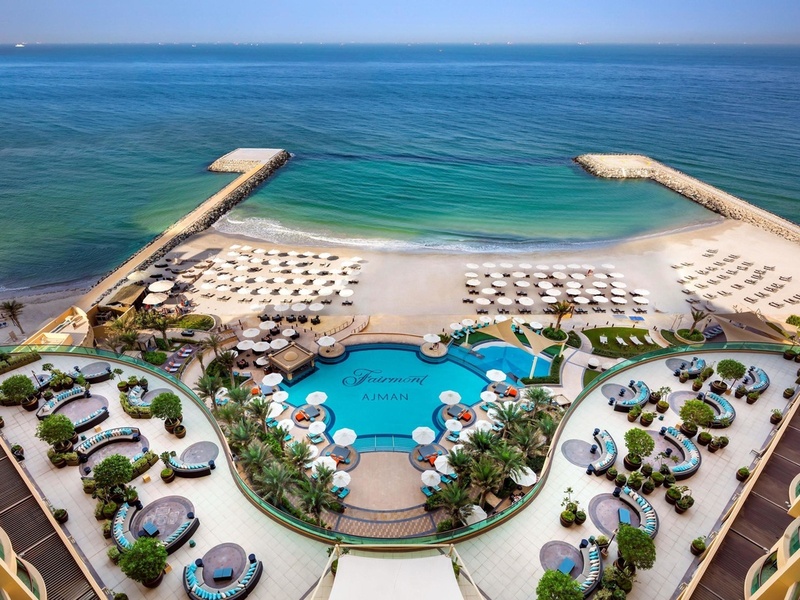 Fairmont Ajman is a beachfront five star hotel beautifully situated in Ajman, the Sincerely Emirati emirate, just 30 minutes away from the bustling metropolis of Dubai. Featuring 252 guest rooms and suites, 8 restaurants and lounges, an infinity pool, kid's club and pool, 200 square meter beach front and water sports. The beachfront location will offer guests a wide range of leisure activities including water sports and diving, and a variety of kids activities as well as access to shopping and cultural excursions. Featuring 252 guestrooms and suites complete with ample space and stunning views of the Arabian Gulf. Combining hospitality and elegance with impeccable service, Fairmont Ajman promises a truly memorable experience during your stay. Bearing the same name as the legendary restaurant that once resided at Fairmont Dubai, Spectrum is the star of our culinary line-up. Designed as a multi-faceted open kitchen, this venue offers cuisines from all over the world. A quaint restaurant with a dynamic dining experience, Gioia offers classic Italian cuisine with a subtle modern twist. This hidden gem features a tempting authentic menu, a traditional pizza oven, and boasts an interactive open kitchen experience. Embodying Turkey's finest cuisines, our signature restaurant presents an interactive family style dining experience in a traditional setting that is sure to bring the country's rich culinary heritage to life. As the hotel's focal point for social activities, the lobby lounge presents a relaxing atmosphere amidst contemporary arabesque surrounds. The perfect place for a quick business meeting, personal time or catching up with friends and family. A Caribbean-inspired experience nestled right on the beach. Relax while sipping a cold beverage, chilling to music, and taking in Ajman's legendary sunsets. This is the perfect spot to complete the day on the beach or feast on a dinner barbeque. Offering spectacular views of the Arabian Gulf, with creative cocktails. This terrace presents many separate and cozy seating circles separated by lush landscaping, that exudes an ambience that is exclusive, dynamic and chic. Fairmont Ajman's new hangout for all sports fans, broadcasting live matches and sporting action.